The Middleboro Gazette Building consists of a three-story building in Greek Revival style measuring 24 feet wide by 42 feet deep and a two-story 22 by 35 foot addition to the rear. The main building, erected in 1876, rises three stories from a granite foundation with the gable end fronting Wareham Street. The walls are constructed of red brick produced in James F. Eldridge’s Purchade brickyard in Middleborough and set in a running bond pattern. The two first floor entries are situated above the level of the street and a flight of concrete steps approaches each one. The entry on the left (east) which accesses the second floor has a modern steel panel door, while that on the right (west) through which entrance to the first floor is gained has a modern plate glass and aluminum frame door of the commercial type. To the right of each door is a large square plate glass and aluminum frame window. A concrete lintel spans nearly the entire façade over the two doors and windows. Hanging from this lintel, over each door, is a lantern-style lighting fixture with a nearly spherical glass globe. The one on the right (west) is missing at present. The window bays on the second and third floor façade all contain 2/2 sash and are symmetrically placed. The three bays on the second floor are rectangularly-shaped and have granite sills and lintels. The two third story bays are segmentally-arched. These, too, have granite sills with brick lintels composed of a single course of bricks set in rowlock fashion. Above these last two windows, in the center of the gable peak, is an engraved marble plaque set into the brick wall bearing the inscription: “ERECTED 1876 BY CHAS. SHOCKLEY”. The fenestration of the side elevations of the main building consists of irregularly-placed rectangular window bays with some articulation in the form of granite sills and lintels. Each contains 2/2 sash. The asphalt-shingled roof of the main building is steeply pitched with deep eaves overhanging the façade. There is an interior brick chimney located below the gable ridge in the center of the western side of the building. The addition to the rear of the main building rises two stories from a granite foundation. It appears to have been constructed in the first quarter of the 20th century, but after 1903 as it does not appear on the map of Middleborough center of that year. The first floor bays of the addition are all segmentally-arched with lintels of a single rowlock course of bricks, and sills. These bays contain 1/1 and 6/6 sash. There is an entry located in the near center of the west elevation of the addition. It has a segmental arch with lintel of two rowlock courses of bricks, and an aluminum and plate glass commercial door. The nine second story windows of the addition are all large industrial-type metal frame windows of twenty lights each, arranged in four horizontal rows of five. The six central lights of each of these windows are framed to open as an awning-type window to provide ventilation. Each of these windows has a narrow granite sill. Over the entry on the west elevation is a large bay for freight. It has a large wood batten door, a granite sill and a segmental arch with lintel of two rowlock courses of bricks. Above this bay is a hoist and pulley. The roof of the addition is asphalt shingled and has a minimal pitch. 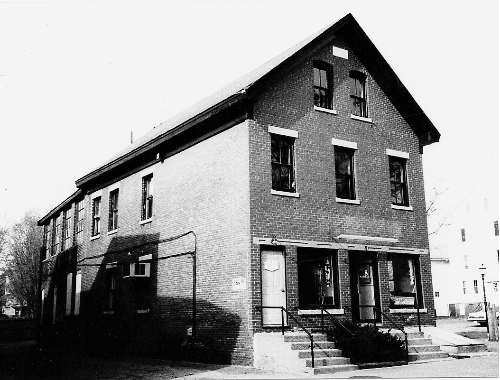 At the time the Gazette Building was constructed in 1876, it was recognized as a substantial building – substantial in size, fabric and design with its first floor set half a story above the level of the muddy street. This fact undoubtedly prompted Shockley to situate the commemorative plaque noticeably in the gable peak to let passersby know of his accomplishment. Ironically, though the building served as a proto-type for two other business blocks in Middleborough (the two Richards Blocks in Middleborough’s West End), the style of the Gazette Building – essentially a brick rendition of the earlier wood-frame commercial buildings in Middleborough - was rapidly outmoded. Later brick business blocks such as the Copeland/Glidden Building, Middleborough Savings Bank Building and Peirce Block were all built on a much greater scale and in vastly different styles including Romanesque and Colonial Revival. The walls of the structure were constructed of brick manufactured at Purchade near North Middleborough with Shockley purchasing 40,000 bricks from James F. Eldridge in April, 1875 [Middleboro Gazette, April 2, 1926, “What the Gazette Was Saying Fifty Years Ago”]. Upon completion of the structure, Shockley placed a commemorative marble plaque in the gable peak. Undoubtedly, Shockley envisioned the building as a rental property, but by whom the main floor was occupied is not known. What is known is that Randall Hathaway and Josiah P. Marshall opened a fish market in the building’s basement in 1876 as recorded in the pages of the Middleboro Gazette which termed the structure the “new brick building on Water street” [Middleboro Gazette, August 20, 1926, “What the Gazette Was Saying Fifty Years Ago”]. In 1882, Shockley sold the building to James M. Coombs of Middleborough, editor of the Middleboro Gazette who was seeking a suitable home for his newspaper after years of rented premises [Plymouth Deeds 484:550]. 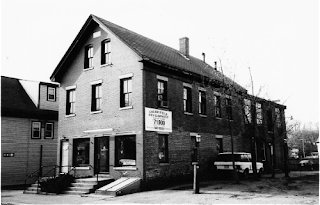 The Middleboro Gazette had been established in 1852 as the Namasket Gazette by Samuel P. Brown (who also served as the paper’s editor) with the first issue appearing on October 7, 1852. Two years later, the newspaper was sold to Reverend Stillman Pratt who changed the name to the Middleborough Gazette and Old Colony Advertiser. The elder Pratt died on September 1, 1862, and the paper continued to be published by Pratt’s son, Stillman B. Pratt who expanded the operations of the newspaper by acquiring additional newspapers outside Middleborough and by establishing a job printing office to print invitations, notices, broadsides, advertisements, booklets, reports and other ephemera for local residents. Among the items printed in the Gazette offices were several of Middleborough’s Annual Town Reports for the period as well as the 1867 Plymouth County directory. Coombs purchased the newspaper in 1869 and continued at its head for twenty-five years. 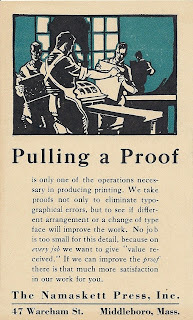 Under Coombs’ direction, the operations of the newspaper were modernized and a permanent office acquired in the form of the Shockley Building. 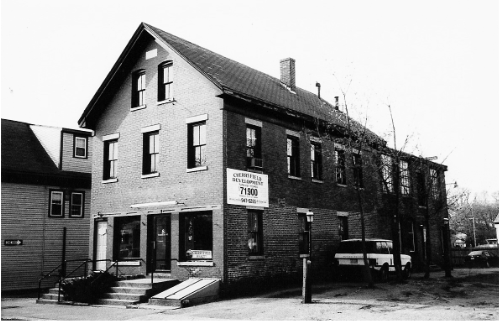 Ill health ultimately compelled Coombs to sell the newspaper to partners Lorenzo Wood and Wallace Tinkham, though ownership of the Gazette Building was retained by the Coombs family until 1913 when Coombs’ daughter, Estelle B. Coombs, sold the building to Dr. Charles S. Cummings [Plymouth Deeds 1154:191]. Cummings, in turn, sold the property in two separate conveyances in 1913 and 1917 to Chester E. Weston who later transferred his interest to the Nemaskett Press, Inc., a job printer which operated in a portion of the building during the first half of the twentieth century [Plymouth Deeds 1154:193, 1273:2, 1392:293]. The property was acquired by Albert Deane who sold it December 10, 1945, to Lorenzo Wood, son of the newspaper’s original Lorenzo Wood, who succeeded his father as owner, publisher and editor of the Middleboro Gazette upon the latter’s death in 1930. Throughout this period, the newspaper’s offices remained in the building. With the death of the second Lorenzo Wood in 1968, the Wood family sold, first, the Gazette and later in 1978 the Gazette Building itself [Plymouth Deeds 4414:74]. Title to the property has since been held by a number of individuals, and the building employed for a variety of purposes including an ice cream parlor, game room, realtor’s office, municipal office space and photographer’s studio. Today, the historic building is occupied by Salon Corsini and two apartments. By the time this photograph was taken, the Middleboro Gazette had moved its offices into the building to which it would later give its name. For years, the Gazette had lived an intinerant existence occupying a number of offices about Middleborough Four Corners. Once located here in what had previously been known as the Shockley Building, the Gazette would remain for nearly a century. 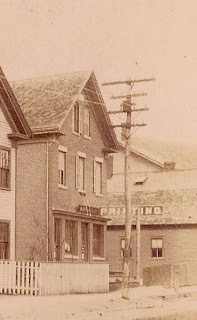 Besides printing and publishing one of the local newspapers, the Gazette operated a steam press which performed job work, a role clearly indicated by the large "PRINTING" sign which hangs from the front of the building. Middleboro Gazette Building, 8-10 Wareham Street, Middleborough, MA, photograph by Michael J. Maddigan, late 1990s. The Nemaskett Press suceeded the Gazette once the newspaper discontinued job print work. For years Nemaskett remained a presence in the building. Wareham Street has been renumbered a number of times. At the time this card was produced, the location was 47 Wareham Street. Middleboro Gazette Building, 8-10 Wareham Street, Middleborough, MA, photographed by Michael J. Maddigan, late 1990s.